The culinary scene in the already sizzling Meatpacking district just got hotter with the highly anticipated opening of Megu New York at the Dream Downtown. 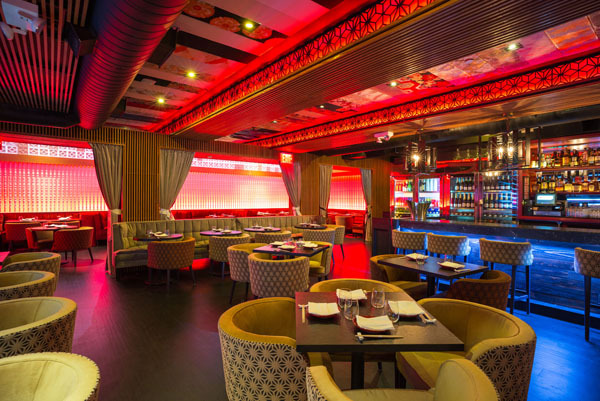 Establishing its name as the premier haute Japanese destination in Tribeca, seasoned restauranteur Jon Bakshi has reimagined a new Megu with his latest concept by introducing 3-D mapping to the New York dining scene along with unique culinary presentations. The 5,000 square-foot venue with 145 seats is filled with customary Japanese interior accents, complimented with a contemporary ambiance. The celebrated modern Japanese concept has been revived with unique design elements by the internationally acclaimed design firm, Dizon Collective, that offers guests a cinematic adventure in dining with revolutionary 3-D mapping. Megu brings a fresh culinary perspective, along with a distinguished bar program, to New York’s dining scene. Situated in a posh subterranean setting beneath the iconic Dream Downtown, the infinity-mirrored staircase descends into the main bar and lounge woven with cherry wood reminiscent of a slightly futuristic shoji screen. The Kimono Room is a culinary suite with a tapestry of antique kimonos layered with a smoky allure, providing diners a front row seat at the sushi bar with additional lounge seating that converts into an optional private dining room. The expansive main dining room, a voluminous space with sake-inspired spindles adorning all three walls, is activated with a dynamic array of 3D visuals that map every surface in the room allowing the space to transform while the cozy six-seat sushi bar also doubles as a private dining room. Notable dishes include King Crab Pineapple Roll with Avocado Truffle, Tobiko, and Shiso; Tatsuta Fried Chicken with Pickled Eggplant and Candied Ginger Sauce; Wagyu Beef and Foie Gras Croquettes with Truffle Aioli and Micro Wasabi; and Branzino Kabocha Risotto with kombu, tamarind wakame broth and basil oil. Crispy Tuna Tartare, Nori Taco Shells, and Edamame lollipop – all made in house – serve as additional highlights. A selection of vegan and vegetarian options are also available like the Okinawa Sweet Potato Ravioli with Kombu Foam, and the Agedashi Tofu with Mushroom Dashi Broth, among others.